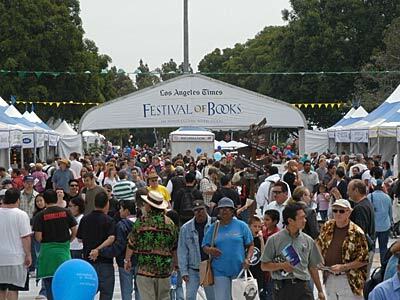 Los Angeles  I was duly forewarned before making my way from Santa Monica to the UCLA campus to visit the 12th Annual Festival of Books, sponsored by The LA Times and the University. 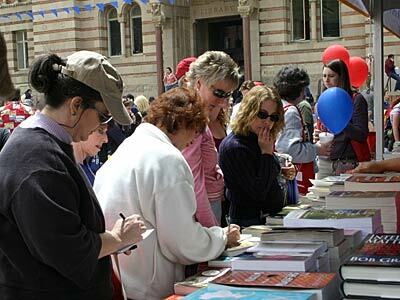 I have friends who make the pilgrimage every year from Santa Barbara, and they had told me that for a lover of words, not only is it an event not to be missed, it is an event that is mind-blowing in its scope. I had arranged for another group of friends to meet me to scope out the event and (thankfully) we had cell phones at the ready, since the festival was not in just one building, but spread across the entire campus. For those who might wonder at the fate of the written word, the festival was a testament to the captivating effect words, writers, and books hold over our imagination. 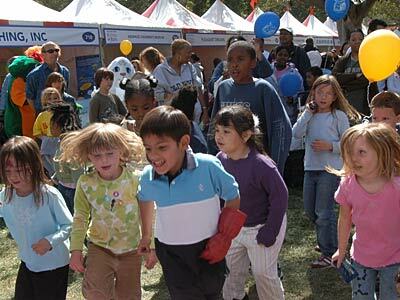 Fifty thousand people descended on UCLA over the two days of the festival. Yes, 50,000. So even with as many as 18 different outdoor and indoor stages and venues, rows of booksellers, publishing companies, exhibitors, food courts, and musical performers, people were turned away from full panel discussions and speakers. Attendees could reserve tickets for indoor events in advance-for a 75-cent service charge, pick up tickets there, or wait in a standby line. Long queues were formed far in advance, as fans lined up to meet and great such rock stars of the book world such as Gore Vidal, Ray Bradbury, T.C. Boyle, Mary Higgins Clark, Frank McCourt, and best-selling mystery writer Michael Connelly. People we don’t necessarily view first as scribes were also on hand to speak about their writing projects, such as Ellen Burstyn, Lee Iacocca, and Kirk Douglas. Kareem Abdul-Jabbar towered over spectators at one of the stages to speak about his recent book, On the Shoulders of Giants: My Personal Journey through the Harlem Renaissance. For those lecture junkies who regularly attend UCSB A&L events-of which, admittedly, I’m one-many of the names on the schedule were familiar, and event recent speakers in Santa Barbara. Jared Diamond, Pulitzer Prizewinner and bestselling author of Collapse: How Societies Choose to Fail or Succeed, packed the house when he came to Campbell Hall, and did the same at the fest. Pico Iyer commented on a panel titled, The Global Village, but made the comment that in actuality, we experience more of a global city. I’m not sure if the event had a political bent, or if that was just my impression from the events and talks I attended. Recently, I finished Michael Pollan’s The Omnivore’s Dilemma. I made sure to catch his morning appearance on the panel, Food Fight: When Did Eating Get Controversial? One of the issues discussed was the disparity in opinion among Europeans and Americans regarding genetically modified foods. Europeans see the GM seeds as coming from American multinational corporations and are concerned with crops and economics. Meanwhile, Americans are worried about health and labeling. Pollan commented that we should be less concerned with the health risks associated with agricultural pesticide residues, and more worried about the effects pesticides have on bees, whose populations are being decimated by agricultural chemicals, but who are necessary pollinators of 40% of agricultural crops. The day wasn’t all about politics: my friends and I headed over to the children’s stage to hear the ever-graceful Julie Andrews speak about the book she wrote with her daughter, titled Thanks to You: Wisdom from Mother and Child, where she also fielded questions including, “What was your first movie role?” “Mary Poppins” was the answer. At the same time, the other half of our group was at the cooking stage where Queer Eye‘s Ted Allen was holding court with his latest effort, The Food You Want to Eat. Not that attending the festival evoked rage. If anything, it had the opposite effect, of inspiring, uplifting, and giving me a long list of reading material to place on my ever-present wish list.